More than 25 work hours per week separated the most time-consuming specialty of vascular surgery and the least time consuming of pediatric emergency medicine. Coupled with their previous research on physician pay, the authors note that primary-care physicians (pediatricians, family practitioners, geriatricians and internal medicine specialists) have working hours toward the middle of the range but earn toward the lower end of the wage scale. Together, the outcomes indicate that the gap in access to primary-care physicians is likely to expand. 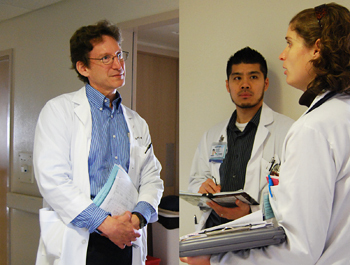 Dr. Richard Kravitz (left) on hospital rounds with medical students. Leigh said the current study has important implications for health-care reform, which will greatly increase demand for primary-care doctors who are already in short supply. In conducting the work-hours study, Leigh and his colleagues used data from a nationally representative sample of physicians in the 2004 to 2005 Community Tracking Survey. More than 6,000 physicians working in 41 different specialties were included. Work hours involved time spent on all medically related activities. Data was analyzed for physicians who worked 20 to 100 hours per week and at least 26 weeks in a year. In addition to vascular surgery, specialties with work hours that far exceeded the average were critical care, neonatal and perinatal medicine, and thoracic surgery. In addition to pediatric emergency medicine, specialties involving the fewest work hours were occupational medicine, dermatology, and physical medicine and rehabilitation. In general, physicians with the fewest hours care for more stable patients, usually in outpatient settings, or have fixed shifts, said Kravitz, whose research focuses on improving quality of care and patient satisfaction. He added that the study results help explain current difficulties in recruiting physicians into certain specialties. The research letter “Annual Work Hours across Physician Specialties” as well as the previous study, “Physician Wages Across Specialties,” published in the Oct. 25, 2010, issue of the journal, are available by contacting JAMA/Archives Media Relations at 312-464-5262 or mediarelations@jama-archives.org. In addition to Leigh and Kravitz, other UC Davis study authors were Daniel Tancredi, assistant professor of pediatrics, and Anthony Jerant, professor of family medicine. All of the authors are affiliated with the UC Davis Center for Healthcare Policy and Research. The study was funded by National Institute for Occupational Safety and Health and the UC Davis Office of the Vice Chancellor for Research. The Center for Health Policy Research conducts research on health-care access, delivery, costs, outcomes and policy to improve the practice of medicine, especially primary care. Established as an interdisciplinary unit, the center includes more than 80 health-care researchers who represent disciplines ranging from business management and epidemiology to psychiatry and pediatrics. For more information, visit the center’s website.